Penthouse apartment Dalia is located in the high attic and provides the guests with a sense of luxury and tranquility. This fully air conditioned apartment has 2 bedrooms, one with double bed and one with twin beds, suitable for accommodating 4+1 persons. Penthouse apartment Dalia IV. has well-equipped bathroom with a bath tub-shower combination and a kitchenette situated within the living room. Elegant and modernly decorated living room equipped with SAT-TV has access to a balcony with a breathtaking seaview, perfect for relaxing in the evenings. 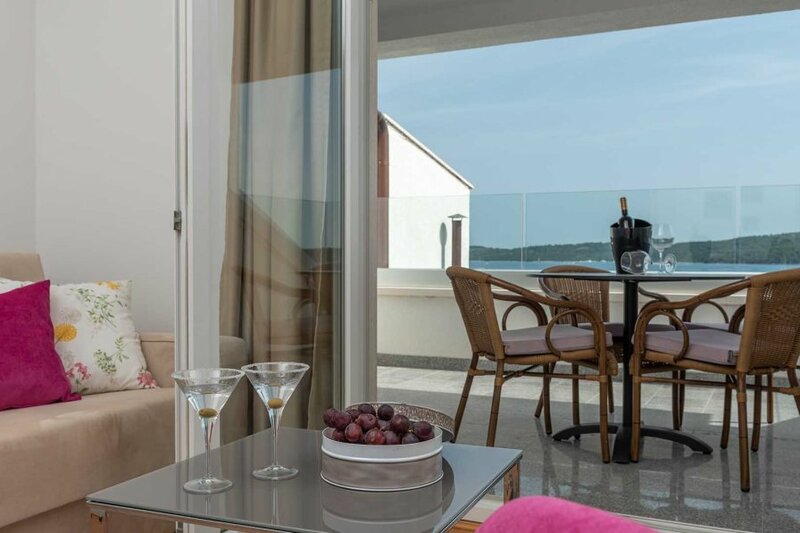 Apartments Dalia are part of a newly renovated aparthotel Dalia located in Seget Donji in the vicinity of Trogir center (2 km), Split airport (6 km) and a marina (3 km). The property is situated just 100 m from the sea and near boat line which connects the area with old historical Trogir center and Čiovo island with beautiful pebble beaches, which makes apartments Dalia an ideal destination for a relaxing family vacation. Upon entering aparthotel Dalia, guests are welcomed by the reception with a bar in the lobby. Guests also have access to an outdoor shared pool (32 m2) surrounded by sun loungers. Aparthotel Dalia offers service of buffet breakfast in a lovely breakfast area overlooking the sea which is automatically included in the price of rooms Dalia, while for the guests who stay in the apartments Dalia breakfast is available for extra charge. High chair and baby cot, as well as iron and ironing board, are available on request. Parking places are also available on request.